Petit Chateau holiday home has been thoughtfully renovated and furnished to a high standard throughout offering luxury and style with many original architectural features. Private heated swimming pool with views, near Bordeaux, Bergerac, Saint Emilion and the Dordogne in south west France. Set against a backdrop of glorious countryside and just 2.5 km from the nearest village of Escassefort which has a true French feel with a boulangerie, small shop and bar. 6km away is the pretty village of Seyches which has an excellent restaurant and further amenities. Larger shops, a multi-screen cinema, restaurants, bars and supermarkets can be found in the nearby town of Marmande 12km away. 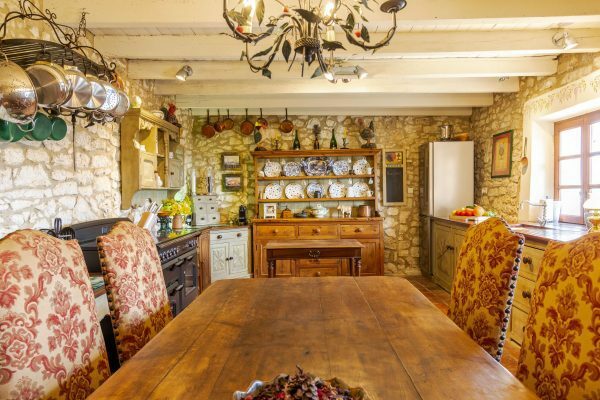 Petit Chateau is an ideal location to explore Bordeaux, Bergerac and the Dordogne regions which are overflowing with vineyards and interesting fortified towns waiting to be explored. The entire house and all facilities are for your exclusive use during your stay. Bergerac airport 45 minutes drive, Bordeaux airport 1 hour 15 mins drive. All of the bedrooms are spacious, tastefully furnished and decorated in gentle French neutral tones, each with beautiful wooden floors, high ceilings and their own sophisticated style. Each bedroom has a room fan. There are also 2 hairdryers for your use. The stunning master suite occupies the whole of the top floor, accessed via the original long spiral staircase it offers loft-style living with a private lounge, viewing area across the gorgeous countryside from the top of one of the turrets, sleeping quarter with large wrought iron bed (150cm x 200cm), satellite TV and large en-suite shower room with wc, the whole space feels very luxurious and extremely private. Large double bed (150cm x 200cm), dual aspect windows overlooking the grounds and countryside. En-suite shower room set into one of the spectacular turrets. Large twin beds (each measuring 100cm x 190cm). Dual aspect windows overlooking the grounds and countryside. This room has a majestic feel with a gold crown and neutral drapes framing the large bed (180cm x 200cm) which can be split into twin beds if required (90cm x 200cm each). Double French windows overlooking the front of the property and countryside beyond. Another pretty room with double bed (135cm x 90cm) and dual aspect windows with views over the front and side grounds of the house. Located next to the shared shower room. A double sofa bed which can accommodate 2 further people is available in the library/study if required. 2 cots with bedding and 2 high-chairs are available on request at no additional charge. In addition to the en-suite shower rooms in the master bedroom and bedroom 2, there is a shower room on the upper floor with large walk-in shower, basin and wc. A further bathroom is located on the ground floor with bath, walk-in shower and sink, a separate wc is located next door. The fitted country-style kitchen is centred around the stone fireplace which houses a range-style oven with 8 gas rings, a further built-in single electric oven, electric hob, dishwasher, microwave, American fridge/freezer with ice dispenser, kettle, toaster, coffee maker and Nespresso machine. The table and 2 benches comfortably seat 6 – 8 people. The door leads out onto the terrace with the picture window offering views across the garden and to the pool. Laundry area with washing machine, tumble dryer, iron/ironing board. There is a washing line in the garden. 3 beautiful living rooms and separate dining room all with a sense of grandeur offered by the high ceilings and be-fitting furnishings, all located on the ground floor with views over the front of the house and countryside beyond. Nestled next to the dining room and between the Morning Room and Library/Study this comfortable room has seating for 7 with a large Chesterfield sofa and armchairs. Flat screen TV with English & French channels, DVD player with a selection of DVD’s. A feature stained glass window catches the morning sun and reflects the beautiful colours and patterns around the room. 2 comfortable sofas are set around the feature fireplace (not useable), an extremely pleasant room to enjoy a quiet morning with the papers, relaxing or reading a book. Accessed via the living room. Beautiful office space, ideal for those that have to work or a quiet reading area with dual aspect windows. The owners have provided lots of information about the local area to help you make the most of your stay. A double sofa bed can be used for extra sleeping space if required. Accessed via the dining room or living room. Situated in the heart of the property next to the kitchen, this magnificent room has double opening French doors leading out to a small terrace, down a few steps into the garden with views out over to the pool. Seating 10 – 12 people it’s a spectacular space for more formal dining. Bed linen, bath towels and pool towels are all provided and included in the price. The private heated pool measures 11m x 5m, is protected by an alarm (not fenced) and has a sun terrace, loungers and a pergola with canopy for shade. A BBQ and outside dining table and chairs offer a relaxed and informal place to enjoy al-fresco dining. Large gardens surround the property and there is a children’s swing for the little one’s. Table tennis. The private drive and parking area gives plenty of off-road parking. Bordeaux station 100km, TGV station. Marmande 12km, train line to Bordeaux. Bookings of 2 weeks or more a change of linen and towels are supplied for each week, the kitchen and the wc are cleaned. When required, heating the house is charged based on consumption. 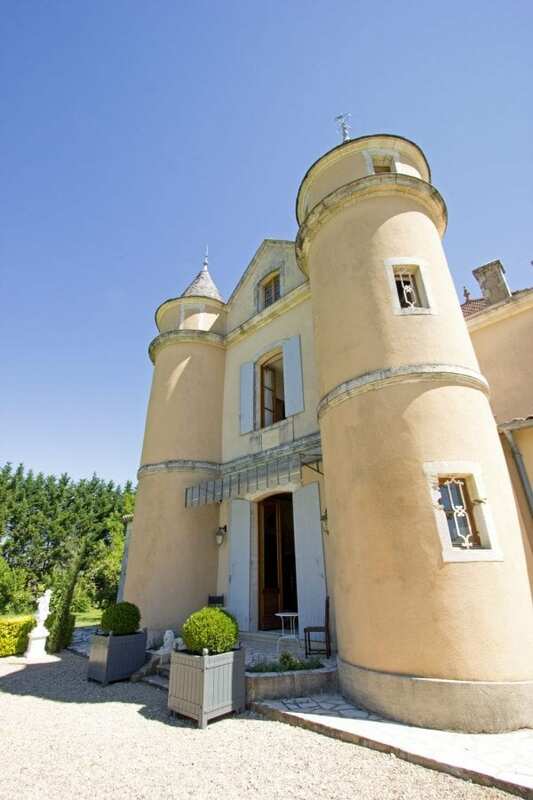 Petit Chateau is situated near the towns of Seyches and Escassefort in the region of Aquitaine and the department of Lot et Garonne within the Bordeaux wine region and near the border of the Dordogne and the Gironde, France. Escassefort 2.5km away has a small shop for essentials, bakers and a small bar. Seyches 6.5km away has 2 restaurants, a bakers and a small shop. 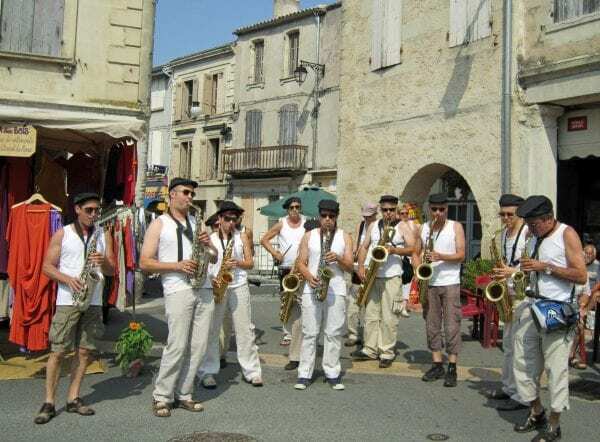 Marmande 12km with most supermarkets and hyper markets, shops in general, weekly market. 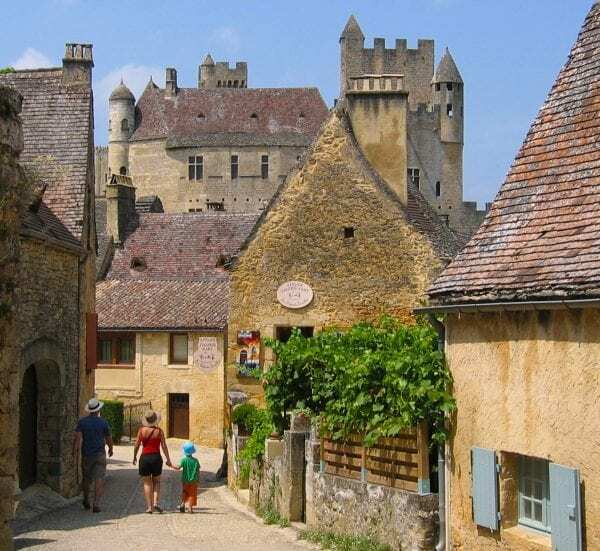 The towns of Monsegur (26km) and Duras (19km) in the region of Aquitaine within the Bordeaux wine region and on the borders of the Dordogne, Gironde and Lot et Garonne, France. Bordeaux city centre is a 100km drive to the west and Bergerac is 47km to the east, Saint Émilion 61km north. A fresh water lake with sandy beach just 47km at Blasimon. Visit Europe’s largest sand dune 155km, the Dune du Pilat where both the climb and the views will take your breath away! Reward yourself by feasting on fresh seafood around the Bay of Arcachon or take the ferry to Cap Ferret and feel the sand between your toes whilst you enjoy oysters and chilled white wine. Not to be missed is the world famous St Emilion 60km. A designated world heritage site and is truly stunning. Explore characteristic narrow lanes lined with wine merchants, cafes, restaurants and interesting independent shops. A guided tour of the monolithic church is highly recommended. There are many pay and play golf courses within the area, the best being the beautiful Chateau Des Vigiers Golf and Country Club 40km. The chateau dates back to 1597 and is set in 450 acres of stunning countryside. Facilities also include a fine restaurant and relaxing beauty spa. Golf Les Vigiers – Le Vigier – 24240 Monestier ( 25 ‘ drive) – Ph +33 5 53 61 50 00 – 18 holes superb golf. Duras: Every Monday from 8.30 to 14:00 (closes at 12:00 from September to June). Nice market, excellent Organic veg’s & fruit producer, Nicolas. Excellent organic goat cheese producers too… Foie gras, Magrets and so on by Mr & Mrs Ros…excellent! …. and many stands of food/non food. Allemans du Dropt (13km): Every Sunday morning. Sainte Foy La Grande (40km): Every Saturday from 8.30 to 12:00. Quite big market with excellent producers. Monségur: Every Friday from 8.30 to 12. Nice small market with good fish stand next to the restaurant Le Grand Cep and fantastic pork butcher under the covered market. Issigeac (44km): Every Sunday morning. Eymet (23km): Every Thursday morning. 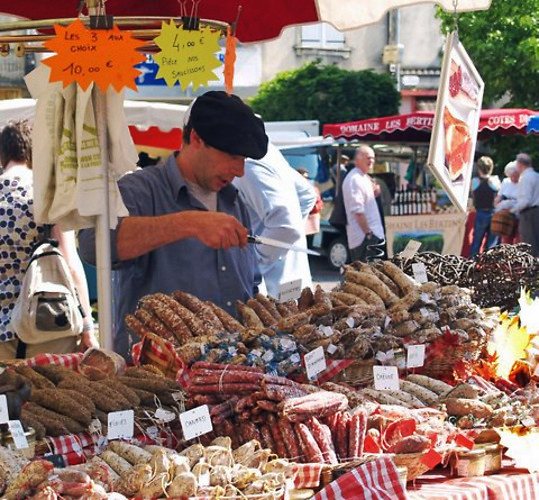 Duras (19km) Night market: Every Thursday evening till end of August. 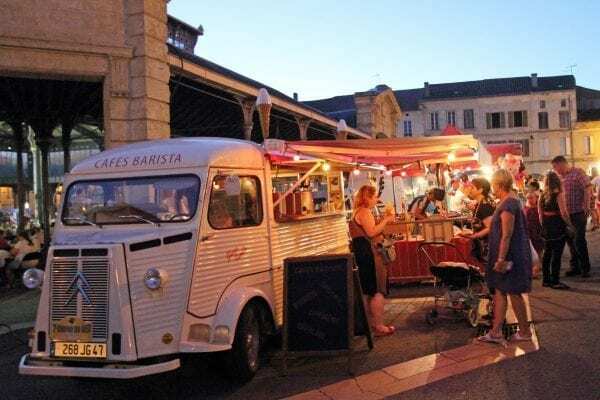 Lévignac de Guyenne (13km) Night market: Every Friday evening till end of August. Monsegur (25km) Night market. Every Wednesday evening till mid of September. boat trips on the Dordogne river to exploring ancient villages. Large E.Leclerc Hyper market plus other supermarkets and retail shops in Marmande 14km. Large E.Leclerc Hyper market in Pineuilh near Sainte Foy la Grande 39km. The chateau was beautifully furnished and spacious. The grounds were extensive, with spectacular views. It was only a short cycle ride to the nearest village for baguettes and croissants in the morning. The pool was of a good size, well maintained and just perfect in the warm summer. There were ten of us in the family group and all, without exception, agreed that it was a splendid place to stay! We stayed for a period of 5 days and it was one the most relaxing and memorable family holidays. Rahul and Daniel were wonderful hosts creating a fun and relaxed atmosphere for ourselves and our kids. The chateau was very clean and accessible as well as child friendly and had more than adequate facilities for our self-catering break. 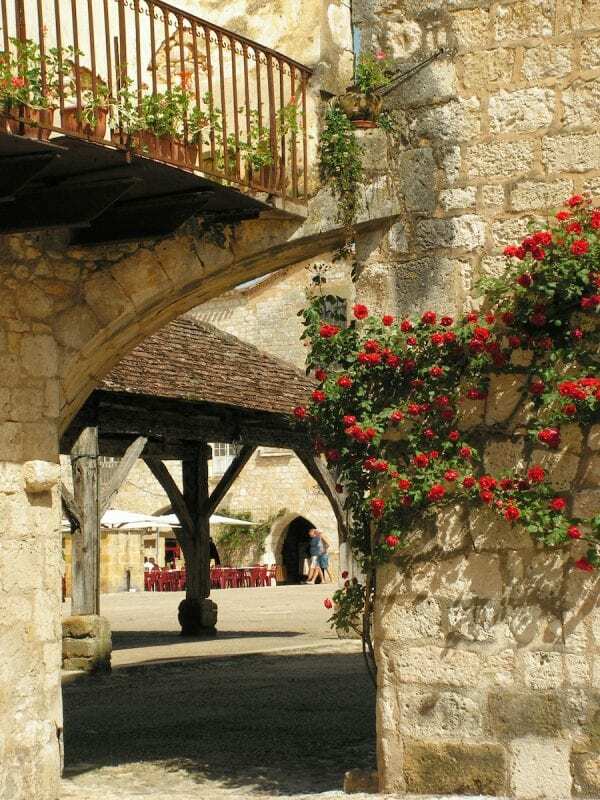 The booklet guide provided at the chateau is very informative about local amenities and attractions – plenty to do! 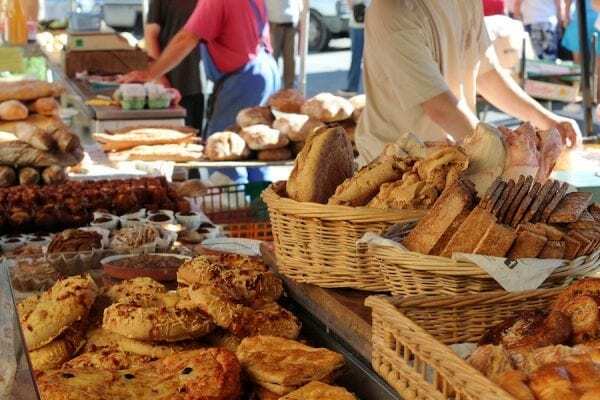 There is a very convenient local supermarket round the corner from the chateau and the picturesque town of Marmande, is a very short drive away which has a lovely range of coffee shops, boutique shopping and weekly food markets. Our kids loved the local horse-riding and running around the beautifully maintained grounds of the chateau. We would definitely recommend ‘Le Bouge’ to anyone who wants affordable luxury from a weekend break to long term stay. We travelled to Le Bouge as a group of married friends in our 30’s. The setting is beautiful as is the ‘house’ and was easy enough to find given the helpful directions from the owner, Rahul. I wanted to note that nothing was too much trouble for Rahul who was insightful and answered any qu’s we had in a very timely manner. A car is a must but we never spent more than an hour in it given the proximity of the house to the highlights of Aquitaine and the Dordogne. 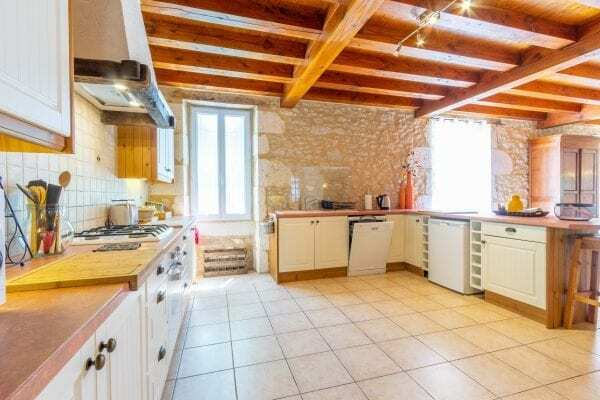 The house is very comfortable, big enough to lose yourself and great for socializing, the pool area is set against the backdrop of rolling French countryside and is the perfect place to relax. During our week stay we cycled, ran and walked, we visited Marmande, Eymet, Duras, Bordeaux, Monbazillac, Bergerac, and St Emillion. At no point did we tire of good food and wine or beautiful countryside! 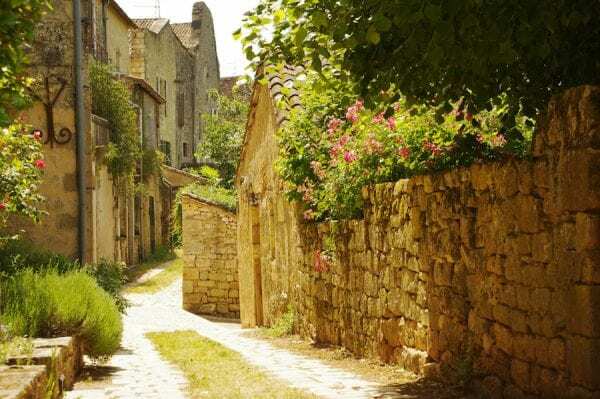 If you are looking for a place where you can relax in a quiet setting and enjoy the French countryside, I would recommend Le Bouge without reservation. I visited the charming Le Bouge in Sept 2014 for a final little end of summer jaunt and fell in love with the place. It’s about an hour and half or just under drive from Bordeaux airport so a hire car is necessary to get to Le Bouge and is also handy for then taking day trips out to lots of the lovely scenic spots close by such as Bergerac, Monbazillac or Eymet for a walk around the beautiful lake. Le Bouge itself is just a perfect little spot. I say little, actually it is very spacious with several large bedrooms large living rooms and a fabulous kitchen for cooking up great meals to enjoy in the characterful dining room or outdoors by the pool side. Le Bouge is ideal for a family holiday because it is so spacious and equally great if you are a group of friends. I loved our evening meals where we would crack open a bottle of wine or two which we’d picked up at one of the many local supermarkets. We had some of the best wine at a fraction of the cost we’d pay back in England. I am now obsessed with Sauternes and I’m hoping to visit again this summer and actually get over to do some tastings at one of the wineries. I honestly can’t recommend this place enough. You will not be disappointed and if you visit once I’m sure you’ll be looking to book a return trip. I certainly am! A lovely holiday home, welcoming and relaxing with a sense of antiquity. Overall an idyllic and very special rental, which we look forward to return to in 2015. The level of personal care from you made the property feel more than just a rental and more like the home of a friend. Thank you. We spent 4 glorious days at Le Bouge in late September. The chateau itself is tastefully decorated, has spacious and light rooms. We stayed on the first floor in a beautiful bedroom with en suite bath room and magnificent views over the inviting garden and pool. Speaking of which, it was a very warm Indian Summer weekend and we spent a lot of the time in the clean and refreshing pool. Le Bouge is also ideally located to explore the surrounding vineyards and picturesque villages. We also reached Bordeaux and the Dune du Pilat in an easy day trip. We spent a lovely week in August with the kids (and grandkids). The property is in a beautiful, quiet location. Despite its feeling of being away from it all, it is still possible to do lots of interesting things which we did anyway. We went to Bordeaux, which we found stunning. We also cycled for a day along the Garonne Canal ending up in a nearby village to cool off with beers. We also visited St Emilion. We also visited Dune de Pila – the highest dunes in Europe, almost two hours drive but a highlight of our trip. Inside the house everything was quite well organised. The kitchen was well equipped and we often ate at home. Sonos was a bonus too. We are now converts to this form of listening to music having tried it here.